I know exactly how this poor soul feels because that is exactly what happens every time my wife and I take a trip. Actually it is even worse these days because most of our trips are planned around actually going to see some Hello Kitty event so there is no “chance” in the equation. My next big vacation is Harmonyland in Japan – it’s like Disneyland but ALL Hello Kitty and Friends. I’m taking my mom and brother, too. I’m 35, mom is 60, and bro is 30 so it’s no kiddy vacation! But after that I am so going to Italy! You would HATE a trip with me especially since all my luggage is Hello Kitty!! how sad… I feel sorry for the poor soul…. You have no idea what you are talking about again. There is a reason that visiting Hello Kitty stores is important and you dismissing this just shows how ignorant you are. The reason that women want to go to Hello Kitty shops is because they are so much more interesting and fulfilling than going to see boring tourist attractions. Plus Hello Kitty makes everyone happy so the atmosphere is joyous and everyone is smiling. Plus everyone wants to go and see Hello Kitty so everyone is in agreement which is not the case when looking at touristy things. That makes Hello Kitty the happiest part of traveling and why she is so important when you travel. Maybe if you understood this before writing stupid comments people would respect this blog more. Visiting HK stores is a bit wierd when traveling as its kinda like traveling to china, & visiting Wal mart & SEARS, instead of the Great Wall , or the bird’s nest stadium. WHY travel all that way, when there is a store just down the street with the SAME stuff?!?!?!?!?!? i LOVE it! stores like this make me smile big smiles! we have one in my area except its super tiny and kinda makes me sad that they call it a Hello Kitty store. darlene, I’m a woman and I would much prefer to go visit the sites that Italy has to offer then go to a place like this. Committing suicide in that store would most probably end up in a hello kitty shape it’s that bad. Looks kind of nice and smart but I if I go it Verona it is because its Verona not because has a Sanrio Store. Thank god I don’t have any Hello Kitty fans in my house. …But I might just go there for giggles. Just goes to prove that you can’t have to much Kitty!!! UGHHH. That is exactly like going to France and passing up all the exquisite French restaurants to gorge at McDonalds… AGAIN. Lovely, I can’t wait to visit Italy! Stop your hating on Kitty you no good slob! What did she ever do to you? People that go hating on Kitty should be executed! There is no good reason for it. wow thanks for the tips MR. HKH!!! 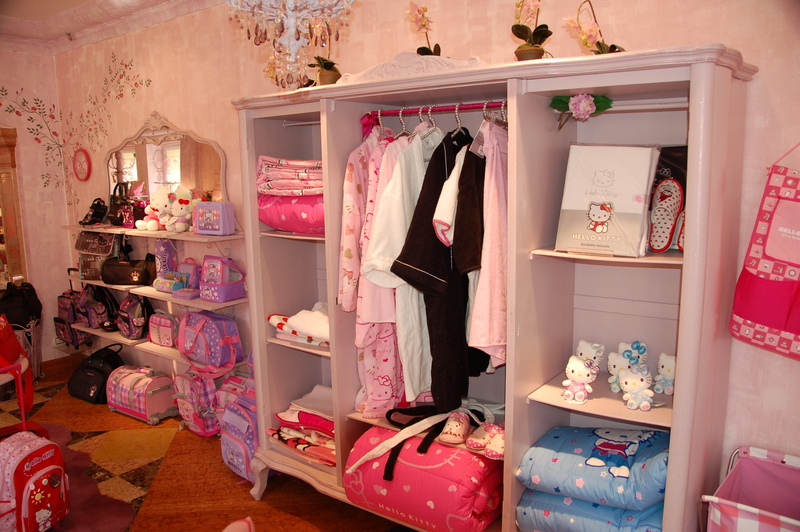 the store is called camamilla…is the store advertised by the hello kitty tram posted a while back. it’s actually a really cute store, and honestly, you guys make it sound like she spent her entire trip in that store…which i hope was not the case haha. O.O ima go there right now! Okay, I would go in there to look… not buy anything though… I just love to look at all the crap they plaster her face on and then jack up the price. Dose this place have a online shop? Sure Italy is one of the most beautifil places of the world! I would take that couch in the first photo in a heartbeat! 😮 sooo….adorkable…. ummm…sooo can that be my house?? !